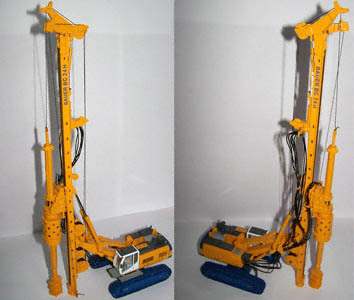 This Bauer BG24H drilling rig is made by Brami. the model has an excellent level of detail. The model is nicely painted and has crisp lettering. Unfortunately, it seems the paint doesn't attach to the plastic parts very well. Because of the bright yellow and blue colors the model is a real eyecatcher. The boom, kelly bar and rotary drive are almost fully plastic, nevertheless the model looks solid. On some plastic parts the seams are clearly visible. This could have been finished much better. A lot of hydraulic hosing finishes the model. A very nice detail is the retractable undercarriage. Even the walkway can be folded up for transport. 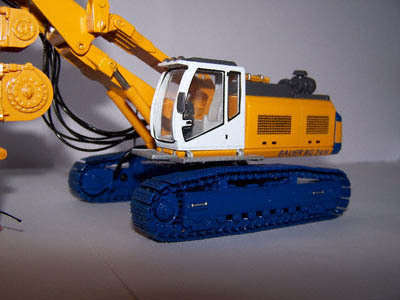 Apart from the retractable undercarriage, the model also features a detachable counterweight and a folding boom head. Because of this the model is well usable as a load for lowloaders, except for the drilling auger, which can't be removed. 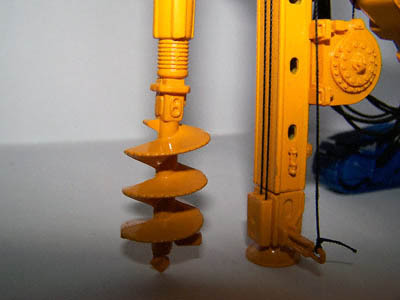 With some minor adjustments, the drilling assembly can be removed. 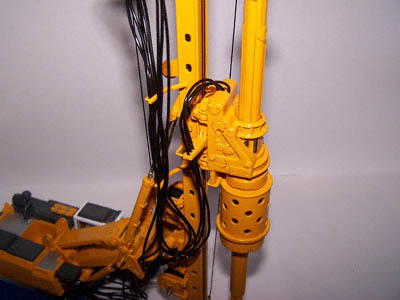 With this drilling rig, Brami delivered a very nice model, which, despite the mentioned flaws, shouldn't be missing in any construction scale model collection.